Please check our class schedule and register online with a credit card (Visa, Mastercard, Discover). We do not accept checks or credit cards over the phone. Read about our fees and sibling discounts. What if I'm not sure your program is a good fit for my child? 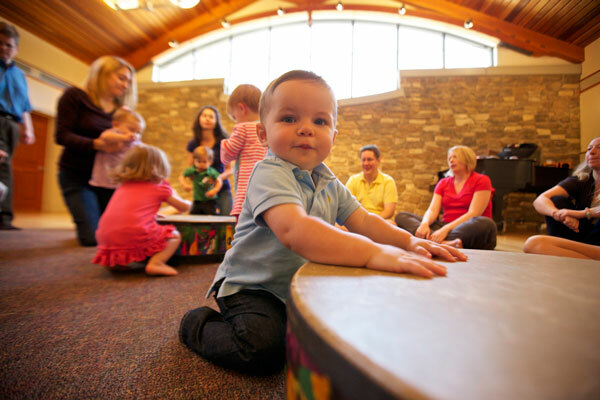 Schedule a free demo class and find out why our families love Music Together of San Francisco. Demo classes are scheduled online only. Children with special needs are always welcome in our classes. What happens if I register and then miss a class? If you need to miss a class, you may schedule a makeup class via our online makeup scheduler. Please go to our make up page for full details. What if my child gets sick during the semester? A runny nose with mucus that is not clear, or a fever within 48 hours before class is a sign that your child is contagious. Please keep them at home and schedule a makeup class. Our classes are 45 minutes of nonstop fun! Adults and children sing , move, and play various instruments. It's a great time to connect with your child through music. Our songs are easy for parents and caregivers to sing, regardless of their own musical ability. No prior musical experience is needed. We have a wide variety of unpitched instruments such as drums, triangles, tamborines, bells, shakers and rhythm sticks. That way, children never feel they are playing a "wrong" note and can join in however they like. We also use chime bars pitched to match the songs and we dance with scarves and other props. The teachers may play keyboard, guitar, flute, recorder, banjo, accordion, sruti, autoharp, or another instrument to accompany the songs. They also use some recorded selections. We serve children from newborn to 5 years of age, and offer both Mixed Age and Babies Classes. There is normally a maximum of 12 children enrolled in each class. Occasionally there may be one or two extra families doing a demo or making up a missed class. Each child or set of siblings is accompanied by a parent or caregiver. My child is unlikely to sit still for 45 minutes! Our classes maintain an informal atmosphere. We don't expect children this young to sit still through a whole class. Normally we have about 3 or 4 activities during the class where we all get up and move around the room. All children are free to wander about the circle or around the room during the class. Parents can re-engage their children and bring them back to the circle at any time. Can I bring my husband or another family member to class? Additional adult family members are welcome to attend with a registered child. They should be prepared to participate actively, not just watch. Yes. Babies under 8 months of age at the start of class may attend free with a paid sibling. Find discounts for older siblings here. Do you sing the same songs every week? No. Each week we sing about 10-12 songs from a 25-30 song collection. So each week children hear mostly familiar songs with a few new ones until we've covered the whole collection. Do you sing the same songs each semester? No. There are 9 different collections so families can take the course for 3 years and not repeat same curriculum. How many classes are in a semester? The Winter, Spring or Fall semesters are usually 10, 11, or 12 weeks long. The Summer semester is usually 7, 8, or 9 weeks long. If I start late, can you prorate the session? Yes, upon checkout, your final price will reflect a refund for the prorated amount for any classes you missed before you signed up. Why can't I enroll any time during a semester? The intimate creative energy that fosters learning in our program develops over the course of a semester. Full tuition is based on a complete cycle of classes, getting to know the songs and each other. Beginning the course after more than half of the classes have passed can be disconcerting for the student and disruptive to the class. I'm expecting and due before the semester ends. If you're expecting and you're not sure how many classes you'll be able to attend, you can pay for half a semester plus materials and registration, then choose whichever classes work best for your due date. Contact us and we'll let you know the discounted price (subject to availability of classes). Why do I need the materials? Your registration fee includes materials that are rotated over a 3-year period. They provide a rich continuity to your child's classroom experience. Children love to hear the songs again at home or in the car. The song collections are chosen carefully from around the world and are updated periodically so it is essential that new materials are taken each semester. Why don't you allow cell phone use in class? We want to create the best possible learning environment for your child, and respect the privacy of all children and adults who attend our classes. Class time provides a chance to forget other obligations and simply sing and move with your loved-one.